Surveys are a great way to discover public opinion. You can get so much data from a survey and it is a good way to reach many people globally. That is why we use surveys to gather data. Unfortunately, there lies a problem in gathering valuable data. It is not as easy as it sounds. That is unless you follow our survey design hack. See, sometimes it happens that the quality of survey responses is awful. That is if you even get responses at all. 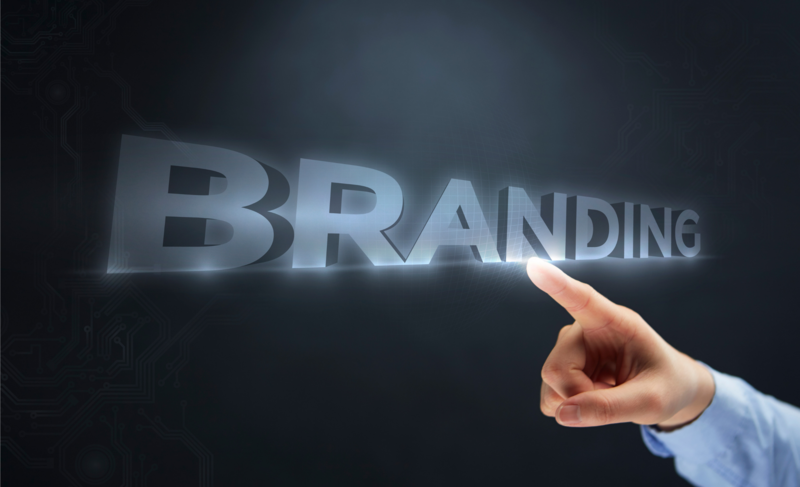 We found that this was most often the case in regards to aided brand awareness questions. This is when a list of brands is provided and the survey respondents must indicate whether they are familiar with a brand or not. In one case, respondents skip the question. 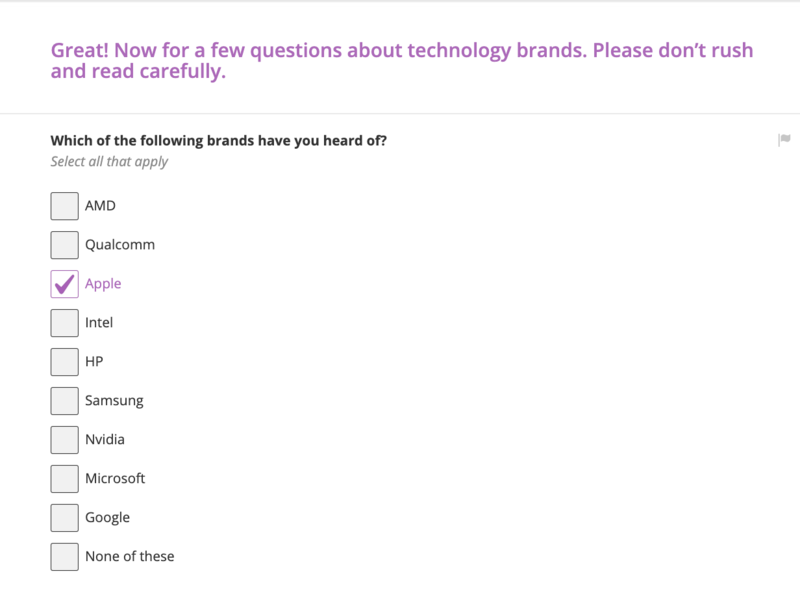 In the other case, respondents answer that they do recognise at least some of the brands listed in the survey. The latter case is the optimal result - until you realise that the results from this question don’t correlate with other data relating to a brand. This leaves you to wondering which data can actually be taken at face value. We have a theory about why the results for aided brand awareness questions can be skewed: respondents are choosing a brand not because they recognize the brand necessarily, but because they recognize the word. This theory will be discussed in this article. We have also devised a tactic that can help solve this problem. It’s as simple as this: visualisation. We include the logos of the brands (alongside the brand name) rather than just the brand name. Intrigued? Continue reading to discover why the addition of logos will increase data quality and what we found when we put this tactic to the test. A lot of effort should be put into designing a brand logo. If this hasn’t been the case for your brand logo, then maybe you should consider a redesign. See, a logo needs to be unmistakable. Consumers should be able to look at a logo independently from the brand name and automatically associate it with a brand. Think Apple or McDonald’s. We hope our logo will have the same effect! The majority of your brand identity sits with your logo. Therefore, it is way, way more important than a plain piece of text. We will go more into why a logo holds more value than text later on in this article. 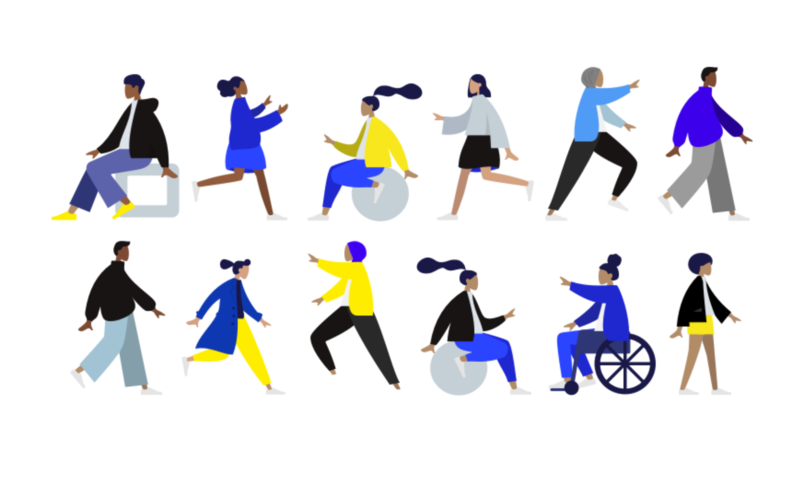 For now, consider this: A logo holds the colors, fonts and visual images that make up an important part of the brand identity. 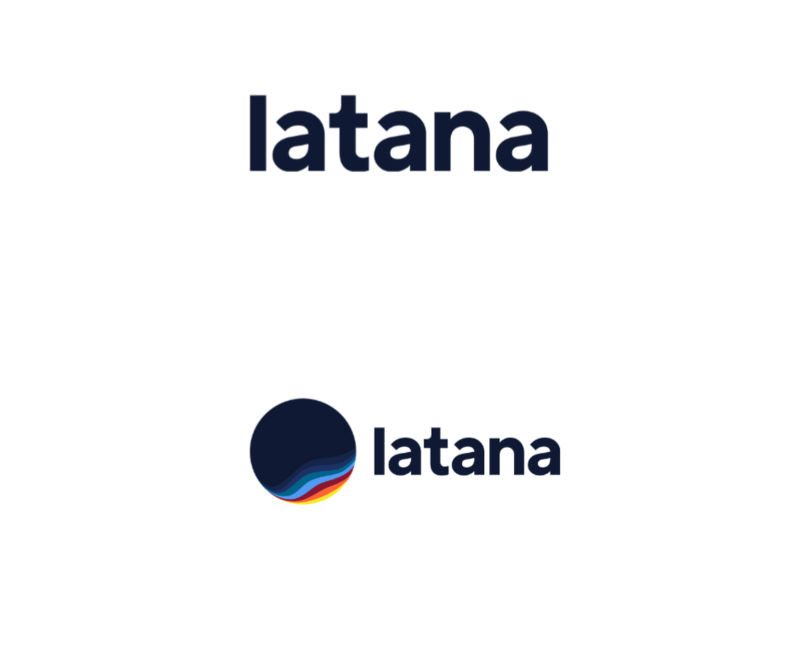 Some brand logos even have hidden messages. Did you know that the Museum of London logo shows the geography of how London has changed over time? Or that the double t in the Galeries Lafayette logo are formed to look like the Eiffel Tower, indicating the brand’s “Frenchness”? Now consider another point: 90% of all the information our brain receives is visual. Amazing, but that’s not all. Visual information is processed 60,000 times faster than text. Even more amazing! Here’s the data that will catch you hook, line and sinker: consumers are exposed to over 5,000 brand messages per day. You need to stand out! A while back, we noticed a problem in our aided brand awareness question. It was actually hard to pick up because it didn’t seem like a problem at first because the numbers it was generating were great. At this point, we were just listing the brand names as text in our aided brand awareness question. Both our clients and ourselves were happy with the results because respondents were happily clicking on brand names and indicated a high level of awareness with a number of brands. This information is crucial for our clients to know how their brand is performing in general, but also how it is performing in comparison to its competitors. So, what was the problem? Well, we began to notice that the number of respondents indicating knowledge of a particular brand didn’t match the responses to other questions. 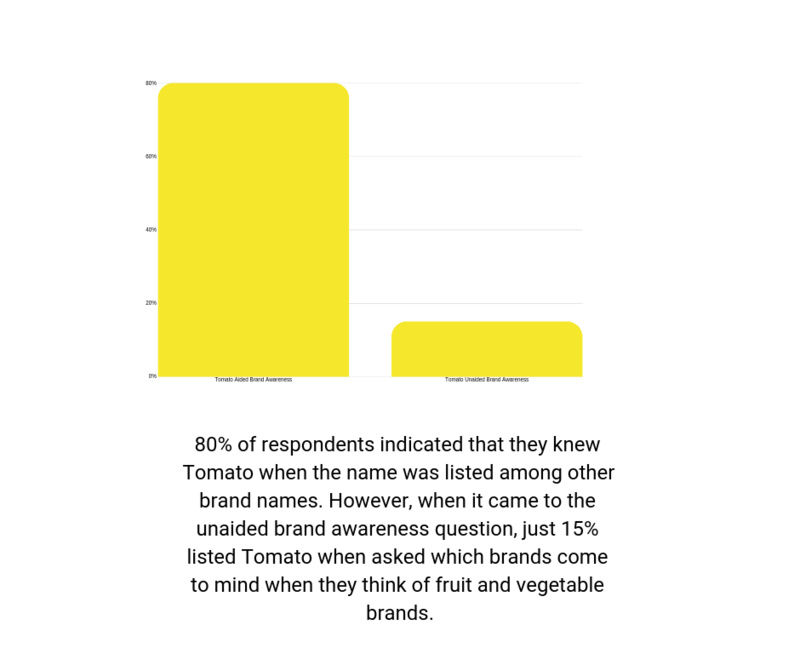 Using the fictional brand of “Tomato” as an example, 80% of respondents indicated that they knew Tomato when the name was listed among other brand names in the aided brand awareness question. However, when it came to the unaided brand awareness question, just 15% listed Tomato when asked which brands come to mind when they think of fruit and vegetable brands. These facts and figures make it apparent why companies take so much time, effort and budget to create a logo that will stick in the minds of their target audience. Then, a client or two noticed that, taking our fictional Tomato brand as an example again, the number of people indicating they knew Tomato in The Netherlands, let’s say, was much too high against competitors considering the small market share Tomato had in comparison. We knew we had to make a change. We value being able to present brands with accurate results and this just wasn’t fitting the mould for us. But what could we do? Where did the problem lie? The problem sat with the brand name. Often the list of brands mentioned in the aided brand awareness question had quite generic names. Think Share, About You, and Wish. This made us think. We took the problem outside the box and began to consider the psychology of humans when it came to word familiarity. An often hypothesised claim is that highly familiar words may be recognised without conscious effort*. Is that what was happening with these generic brand names? When a brand with a generic name is listed as part of a survey question, respondents choose the brand name not because they were familiar with the brand, but because they are familiar with the word. We believed that this could be the crux of the matter but how could we prove it? How could we know if a respondent would provide a better answer if the brand logo was included alongside the name? There really was only one answer here. An A/B test of course! Test A ran the aided brand awareness question as usual, with just the name of the brand. Test B brought in all we knew about logos (now you understand why we spent time at the beginning of this article discussing the importance of a strong brand logo). We wanted to see would responses change when respondents were shown the brand logo as well as the name. The answer is “yes”, Substantially. 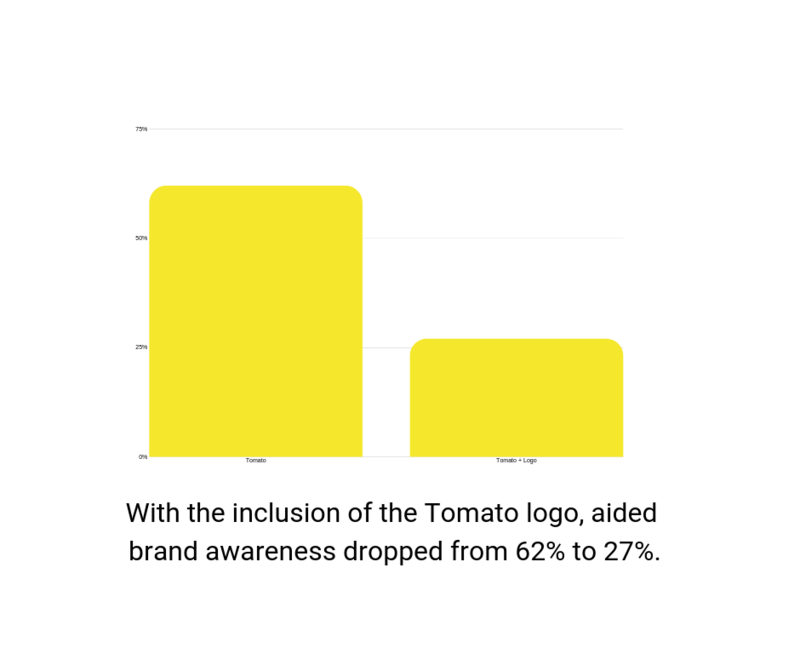 With the inclusion of the Tomato logo**, aided brand awareness dropped from 62% to 27%. This new result was more in line with market share and other marketing KPIs. Nevertheless, that is a big drop and we wouldn’t blame you for thinking that it equates to a bad thing. This is not the case. It is actually a good thing because now it means that the Tomato brand is receiving accurate data. With accurate data, Tomato can better align their marketing activities and push their focus and budget toward developing an area of which they are confident. The lesson learned here is that visualisation is key. Just like Facebook videos and Instagram stories perform better than other forms of content, brand surveys can perform better with the inclusion of logos. If you would like to know more about how we ensure accurate data, check out our MRP page. **we are using Tomato here but the results are real. We just swapped out the real brand name for another.